You will enjoy this spacious and open floor plan with hardwood flooring, skylights, T & G ceilings, plant shelves and wood trim through out. Enter the great room off of the front covered wrap around deck. Plenty of room for all to cook in this kitchen - lots of cabinets and counter space - large pantry area. Entertain all from the high top breakfast bar - eat in kitchen and/or the formal dining room with bay window. Master on main level with sitting area, bath with double sinks, Jacuzzi tub and separate shower. Also second master downstairs with a cozy warm wood stove or use as a game room or office area. Oversized HEATED two car garage with plenty of room for a work area. 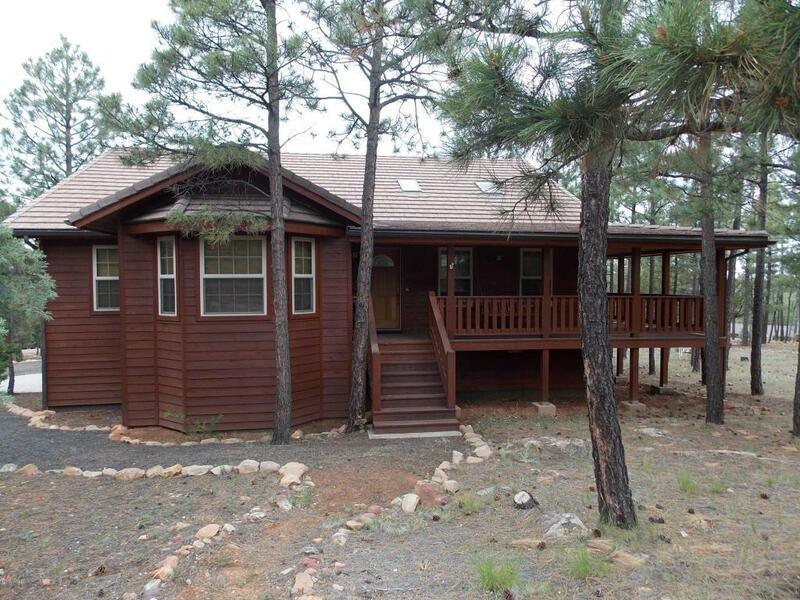 Cabin surrounded by mature Ponderosa Pines which you can enjoy as you relax on the covered deck.